Let’s start a dialogue about fairness in the workplace for the active baby boomer! Is 80 The New Retirement Age? Many Americans Think So. What do the Employers Think? This is the title of a recent Forbes article! The article cites a Wells Fargo Survey of affluent Americans. According to the survey, “The concept of ‘retirement age’ is going the way of the typewriter, another 20th-century relic that has been made irrelevant by changing circumstances.” Concerns about having enough for retirement are driving this sentiment. The study shows that 20% of affluent Americans say they will need to keep working until at least the age of 80; 25% of middle-class Americans feel the same. It is even more startling that 21% of working Americans between the age of 60 and 75 don’t know when they will stop working. In fact, 73% of non-retired affluent and middle-class Americans say having a specific amount of money dictates the time of retirement and not the age one reaches. And as we all know, retirement investments have been hit hard in this recession. According to the AARP survey report, “Among the 19 employee qualities examined in this survey, employees ages 50+ receive high ratings on each of the five qualities that HR managers in the Midwest deem most essential in employees of any age. These qualities are commitment to doing quality work, ability to get along with co-workers, loyalty and dedication to the company, dependability in a crisis, and willingness to be flexible about doing different tasks. In fact, of these five most desirable employee qualities, all but one are also among the top five qualities of employees ages 50+. 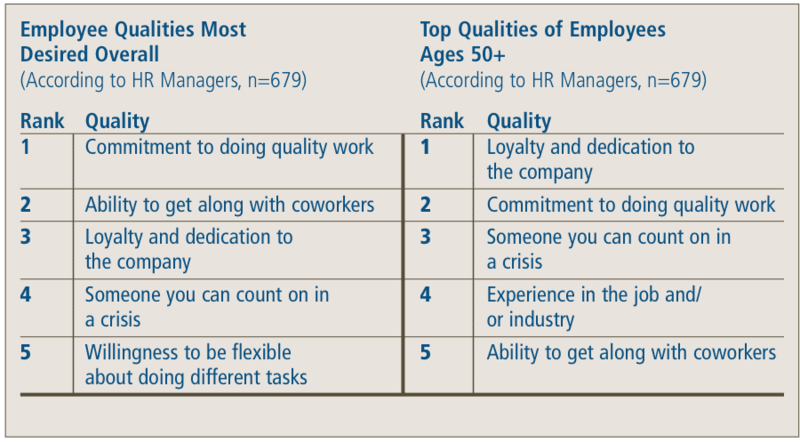 And, even on the attribute that is not among the top five qualities of employees 50+ —willingness to be flexible about doing different tasks—workers 50+ still receive a fairly high rating. “When asked at what age they begin to consider someone to be an older employee, approximately half (51%) of HR managers either said that they did not know or did not answer the question. Of those who provided an age, the majority identified an age between 50 and 60. On average, respondents who provided an age identified 57 as the age at which they begin to consider someone to be an older employee.” The youngest baby boomers are turning 48 years old in 2012 and may consider themselves still in the upside of their careers, yet they are less than 10 years away from the age identified in the survey as an ‘older employee’. So…workers staying in the workforce longer should be a positive thing for employers who may face a shrinking qualified employee pool. However, according to Alicia Munnell and Steven Sass in the book Working Longer; The Solution to the Retirement Income Challenge, employers had never been keen on hiring older workers or on retaining employees past their organization’s traditional retirement age. Most employers are not prepared for this shift in age distribution of their employee base. 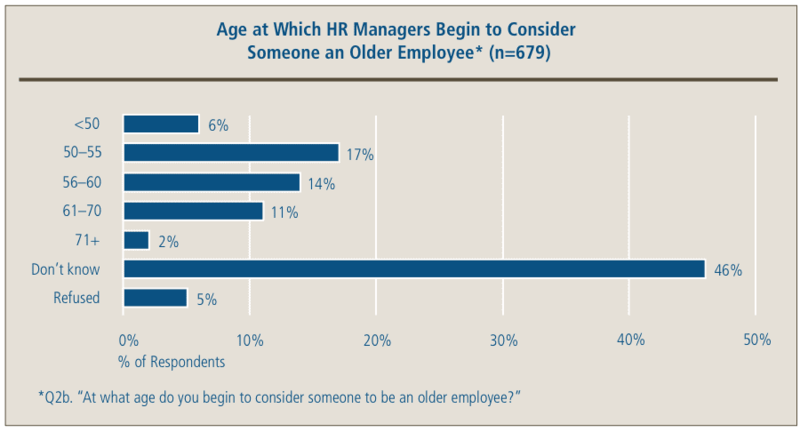 Just as younger employees entering the workforce have special requirements, so do older employees. Do the advantages of hiring and retaining older workers outweigh the disadvantages? Will employers retain or hire older workers “only” if it is profitable to do so – if the value of what they produce is greater than what they are paid?- as Munnell and Sass suggest. BPG will explore these and other related questions in future posts. For example, what is the productivity of older workers and how is it measured? What is the ‘cost’ of employing older workers? What qualities are most desired in your organization and do they align with those qualities exhibited by the older workers? If all the employees over the age of 48 left your organization, would the loss of valuable institutional knowledge, industry experience, and intellectual property be detrimental to the company’s success?